As far back as 1990 Jonathan Royle in his former stage name of Alex-Leroy was regularly featured in International Media Publication "Psychic News" during which time they dubbed him the New Uri Geller and Doris Stokes rolled into one. Over the past 20+ years his "Psychic Style" performances have often included routines where he apparently helps an audience member to develop their own powers so they are then able to read the minds of audience members in a most amazing fashion. Routines such as this (and the principles behind them) were used with great effect in Royle's European Television Series "Life In The Bus Lane" which was filmed in Amsterdam in what is now fast approaching a decade ago. And for those who notice some similarities in the routines you will learn and which will become possible and practical to you after reading this ebook with those recently released by Kennedy (Ken Dyne) & Colin McLeod, for the record Royle has spoken to both parties about the methods used and has both established that a different methodology is, in the main being used in these routines and more importantly both Kennedy and Colin McLeod were both kind enough to give Royle their blessing in releasing this project. All of the routines and ideas contained within this unique new "Klear Thoughts" package have been performed in the real world (unless stated otherwise) and the bonus materials that those who secure a copy today will also be sent have as you will see later on further down this page received rave reviews from major names in the world of Mentalism - Magic and Hypnosis. Therefore in order to ensure that this ebook remains as intended for the limited few serious minded individuals who will appreciate the miracles they will have available to them, it is a condition of purchase that you agree to never divulge the secrets within the pages of "Klear Thoughts" and also that you will never sell, loan or give away your copy to anyone in any manner. In this powerful routine, the freely chosen friend or relative of a randomly chosen audience member reads the minds of the audience from a long distance over a mobile telephone. This is a variation of Royles Hot Line routine which allows a randomly chosen audience member to become the mind reader without any pre-show. ii) A second version where they are able to read the minds of 3 (or more) audience members and reveal the randomly chosen words that all of them are merely thinking of with nothing being written down by them at any time. A discussion & detailed explanation of the technique which inspired the name for this ebook collection. You'll be taught a simple way to easily make an ingenious low cost gimmick that will enable you to turn any audience member into an instant mind reader with the greatest of ease and without any form of pre-show work. With a Little thought those who have a copy of 13 Steps to Mentalism by Tony Corinda and some commonsense will easily be able to as suggested within the pages of this ebook duplicate the kind of effects you have most likely until now only seen performed by the Famous Name Television Mentalists. Yes that's right not only will this gimmick enable you to turn people into instant mind readers in a manner where all involved will be just as amazed as the watching audience, but also you will learn how to take random audience members and apparently read their minds in the cleanest manner possible. Would you like to be able to during your act apparently ask 3 random members of the audience to stand up and then one by one be able to tell them exactly what their Star Sign is without any pre-show work, no stooges or instant stooging, no cueing, nothing written down, in fact this looks as close to pure direct real psychic style mind reading as you are ever going to get and you'll also discover how this approach could also be used to reveal other pieces of personal information about "random" volunteers which you could apparently have no logical or possible way of knowing. If you like Isabellas Star by Peter Turner your going to love these totally different ways of revealing peoples Star Signs with the absolute greatest of ease! This unique solution to the legendary Any Card At Any Number (ACAAN) made famous by David Berglas is probably the cleanest and most practical method you will ever learn. Only a handful of people have ever been taught this method during a special workshop Royle held in Bournemouth as part of The Southern England Magic Convention (SEMC) 2011. With this routine a sealed envelope is shown and everyone is told that this contains a prediction which will be referred back to later, then a deck of cards is handed to a randomly chosen audience member who shuffles the deck to their hearts content and then they are handed back to the performer who gets someone else randomly chosen by the first spectator to name a playing card in a very open and fair manner. The cards are now once again shuffled by another randomly chosen spectator who is then asked to place them face down onto the table in front of all to see. The randomness of everything is recapped on and then the prediction envelope which has been in full view at all times is picked up and opened, the contents being removed and much to everyone's amazement inside the envelope is one playing card which is an exact duplicate of the card which was freely named by the audience member. Indeed Tony Black (Anthony Galvin) has stated on several magic forums after seeing Royle perform this routine at The Southern England Magic Convention 2011 that it is perhaps the most commercially practical version of the "Holy Grail" that he has ever seen! You'll discover how to make two special decks of cards and then in conjunction with two other real world magical principles that have stood the test of time you will be able to perform what will appear to most audiences including many magicians an incredibly clean version of A.C.A.A.N. 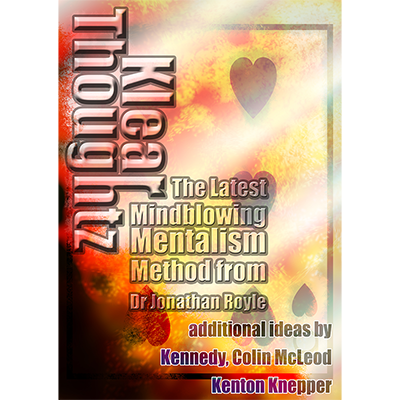 Yes indeed at the end of the "Klear Thoughtz" Ebook you will find links to allow you to watch online almost 15 hours of Private Mentalism & Hypnosis Training Videos. These include the entire footage of Royles "Mind Miracles Mentalism Training Weekend" which was dubbed by many who attended as "Beyond the 13 Steps to Mentalism" this video training is worth many times the cost of this ebook alone.